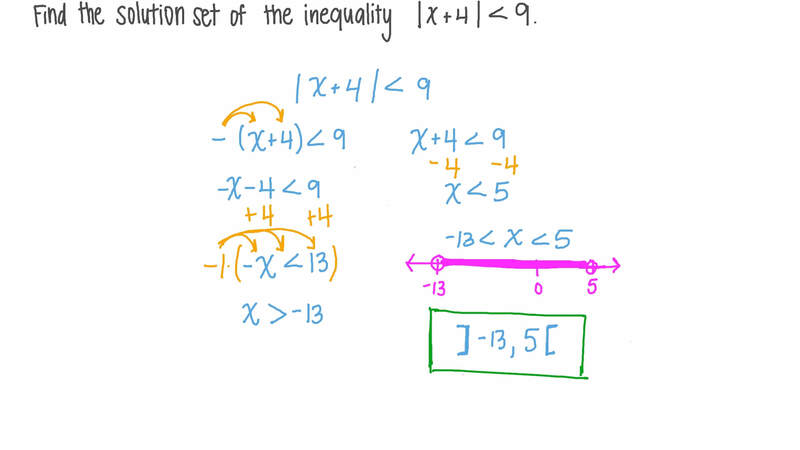 In this lesson, we will learn how to solve inequalities that contain absolute values. Find the solution set of the inequality | 𝑥 + 4 | < 9 . Find algebraically the solution set of the inequality . Find algebraically the solution set of the inequality | 6 − 𝑥 | < 3 . Find the solution set of the inequality | 𝑥 − 6 | ≥ 7 . A body was moving with a uniform velocity of magnitude 5 cm/s from the point 𝐴 to the point 𝐶 passing through the point 𝐵 without stopping. The distance between the body and the point 𝐵 is given by 𝑑 ( 𝑡 ) = 5 | 8 − 𝑡 | , where 𝑡 is the time in seconds, and 𝑑 is the distance in cm. Determine the distance between the body and the point 𝐵 after 5 seconds and after 11 seconds. A body moved from position 𝐴 to position 𝐶 passing through position 𝐵 with a uniform velocity of 3 cm/s and without stopping. If the distance between the body and position 𝐵 is given by 𝑑 ( 𝑡 ) = 3 | 7 − 𝑡 | , where 𝑡 is the time in seconds, and 𝑑 is the distance in centimetres, determine the time interval during which the body is less than 9 cm from 𝐵 . Find algebraically the solution set of the inequality | 8 − 𝑥 | > 1 7 . A factory produces cans with weight 𝑥 grams. To control the production quality, the cans are only allowed to be sold if | 𝑥 − 1 8 3 | ≤ 6 . Determine the heaviest and the lightest weight of a can that can be sold. Which of the following represents the interpretation for | − 3 . 3 − 𝑎 | > 5 ? AThe distance between − 3 . 3 and 𝑎 is greater than 5. BThe distance between − 3 . 3 and 𝑎 is less than 5. CThe distance between − 3 . 3 and − 𝑎 is greater than 5. DThe distance between − 3 . 3 and − 𝑎 is less than 5. EThe distance between 5 and − 3 . 3 is greater than 𝑎 . Find the solution set of the inequality | 𝑥 − 3 | ≤ 7 . Find the solution set of the inequality | 𝑥 − 8 | > 2 . Suppose that | 2 𝑥 − 𝑏 | < 2 and 𝑏 > 6 . Which of the following is true? Suppose 𝑎 < 0 < 𝑏 . If 𝑏 > 2 , which of the following statements is true? Solve | 𝑥 − 6 | ≤ 5 . Solve 𝑥 − 4 < | 2 − 𝑥 | . What is the interval which represents the set of all real numbers that are less than or equal to | 6 | ? Find algebraically the solution set of the inequality | − 3 − 2 𝑥 | + | 2 𝑥 + 3 | < 2 6 . Find algebraically the solution set of the inequality | 3 − 𝑥 | + | 2 𝑥 − 6 | ≥ 5 7 . Use the graph to find the solution set of the inequality 𝑓 ( 𝑥 ) ≥ 𝑔 ( 𝑥 ) . Find the solution set of the inequality | 𝑥 + 1 | < 6 . Find the solution set of the inequality | 𝑥 − 2 | < 4 .